Great summer dining with a recipe from the Gourmet Easy Dinners magazine, with minor adjustments. Whisk together garlic, vinegar, oil, salt and pepper in a large bowl. Set aside two-thirds of vinaigrette for brushing. Halve onion lengthwise and cut halves into 1/2″ wedges. Thread 1/2″ apart on skewers. Brush onion and eggplant with some of vinaigrette. Oil grill rack, then grill peppers, onion and eggplant with cover on. Turn occasionally. Onion and eggplant should be very tender. Transfer to rimmed baking sheet. Continue to grill peppers until skin is blackened. Put peppers in a deep bowl and cover while doing other vegetables. Quarter squashes lengthwise, brush them and tomatoes with vinaigrette. Grill, covered, turning squashes once or twice. Peel peppers and thinly slice. Cut tomatoes into wedges and chop remaining vegetables very coarsely. Add to bowl of vinaigrette along with herbs and salt to taste, tossing to coat. When I prepared this I didn’t chop the vegetables, and I also neglected to add the parsley and basil. I forgot to read the recipe right through to the end. I also increased all the quantities because if I’m going to grill, I going to grill lots! The vinaigrette added greatly to the flavor of the veggies – delicious! This photograph depicts summer bounty perfectly! Thanks for the like and comment on my wrongs. If you get a chance, pop by Flat Ruthie at the Olympics http://cardboardmetravels.com. Promenade Claire did such a nice job hosting. I look forward to more delicious posts and pics. One of my favorite summertime dishes…love your presentation. Thanks so much. I was pleased, and I didn’t forget and leave anything in the kitchen! That looks truly fantastic. What a great way to cook veg. Thanks. Think I’ll do more today, as they are excelllent to have on hand. Hope you’ll give them a try! That looks amazing — so healthy, fresh and colorful. 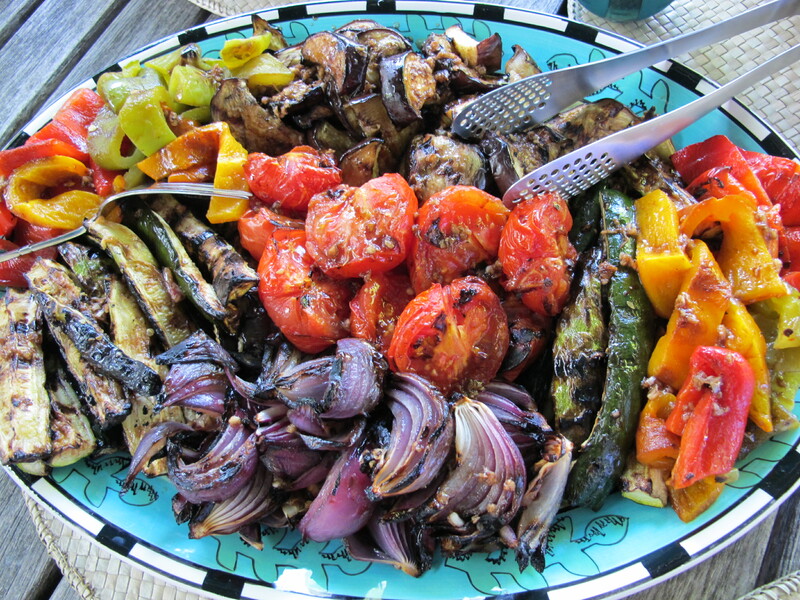 There’s nothing better than grilled veggies in the summer! Thanks. You should give it a try – it’s a simple but delicious recipe! This looks gorgeous! A real rainbow on the plate. I love your twist to this classic soupy dish! Thanks. For a bonus it is as tasty as it looks! Thanks for stopping by! Thanks. People were ready to dig in when I remembered my camera and yelled, “WAIT!” My guests were a little taken aback but they got it.